Prime Time Sports Talk | Should Anthony Davis be the Celtics’ top Priority? Should Anthony Davis be the Celtics’ top Priority? One of the most talked about subjects around the Boston Celtics has been the idea of adding yet another All-Star caliber player to their roster. The prospect of Anthony Davis stepping onto the parquet in a grade jersey has been the genesis of trade proposals from fans and sports media outlets all season. 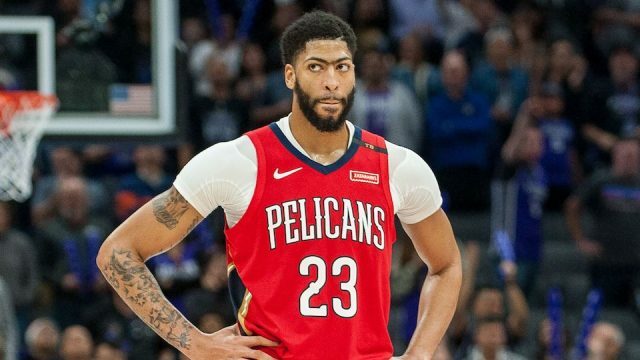 The rumors have only seemed to intensify, as it was recently reported that Davis has requested a trade from the New Orleans Pelicans and that Boston and Los Angeles are the top suitors. Davis has been posting huge numbers this year, averaging 29.3 points per game, 13.3 rebounds per game, 4.4 assists per game, and 2.6 blocks per game. The career numbers were not enough to warrant him a starting spot in the Western Conference’s All-Star team, but the Brow has been unstoppable all year. Currently sidelined with a volar plate avulsion fracture in his left index finger (per ESPN), Davis’s absence from the Pelicans lineup has been showing. The team is 0-4 without their star, and are going to need to learn how to win without him. The Celtics would get better with Davis on the roster, that’s obvious. But as far as trades are concerned, the Celtics cannot have Kyrie Irving and Davis on the same roster due to the Rose rule, where it prohibits teams from acquiring two players who signed six-year max extensions. Because of this, the Celtics would have to resign Irving as soon as possible and restructure his contract, accept trade terms that aren’t finalized until after July 1st, or wait for free agency. The other issue is the players the Celtics would be giving up. The biggest name the Celtics are likely to move on is Gordon Hayward, who is currently sitting on a 100-plus million dollar contract and coming off the bench. Hayward is averaging 10.8, 4.6 rebounds, and 3.4 assists points per game. Those numbers are far from what the former All-Star used to put up, but he is seemingly not fully recovered from his broken ankle he suffered last season. Celtics fans have had a lot of hope for their key signing, but have grown tiresome after 50 games into the season. Another player that is rumored to be moving is 22-year-old bench player Jaylen Brown. The Celtics took Brown with the third overall pick in the 2016 draft, but he has not amassed to the stardom people projected for him in his third NBA season. Brown has shown signs of potential, but with 12.3 points per game, 4.2 rebounds per game, and 1.3 assists per game, Celtics fans have much higher expectations for the Georgia native. The last rumored trade asset is star second-year player, Jayson Tatum. Tatum is a player with enough quality and potential for the Pelicans to be interested in swapping Davis for, but Danny Ainge and the Celtics are unlikely to give up their extremely talented 20-year-old forward. Tatum has been a part of the Celtics starting five that has been clicking this year and has continued to excel not only offensively but defensively as well. The Duke product is unlikely to play anywhere but the TD Garden if the Celtics organization has any say about it. By moving any three of those players, the Celtics lose an extremely key aspect to their team, which is depth. Though the Boston bench has been disappointing as of late, the Celtics depth has the quality that many of the teams they go up against do not. Losing Hayward or Brown, who have both been key to the Celtics bench as of late, could bring more struggles to the bench while losing Tatum would be giving up one of the highest potential players in the NBA. Not only would losing depth hurt the Celtics, but salary and contract issues could come with Davis. Davis is a free agent this summer and had he stayed with New Orleans he could have signed a five-year, $240 million supermax extension. But his need to play for a contender overpowers his need for money. Celtics have contracts of their own to deal with this summer, as Kyrie’s contract is up, but the point guard has already stated his intentions to resign. 29-year-old forward Marcus Morris also hits free agency this offseason, should the Celtics not resign him. Morris has had a stellar year in Boston, averaging 14.6 points per game while shooting 47.6 percent from the field and 42.2 percent from behind the arc. Morris a key component to the Celtics roster, and will want more than the $5 million contract he is currently on. Two more players with expiring contracts are Terry Rozier and Al Horford. Rozier is a player that may leave Boston, having an unsuccessful season and rumored to want more money, Ainge may let the beloved “Scary Terry” walk this summer. Horford, on the other hand, has a $30 million player option for next season, that he will likely accept. Boston has an extremely high payroll, with Horford and Hayward both making over $30 million a year and Irving likely to sign a contract in that range as well. With young talents such as Tatum and Brown, along with key players like Marcus Smart and Morris, bringing in as large of a contract may restrict the Celtics from keeping this core intact. With the Lakers also heavily pursuing the star forward, the Celtics will need some Ainge magic to bring the Brow to Boston without a major loss.